Polychlorinated biphenyls (PCBs) have been outlawed in the United States since 1976-yet they are currently found in the remotest corners of Earth and remain the most prevalent group of industrial chemical contaminants in much of the world. Every human being, from the womb to the grave, bears a body burden of these poisonous molecules forever locked in their blood and tissues. 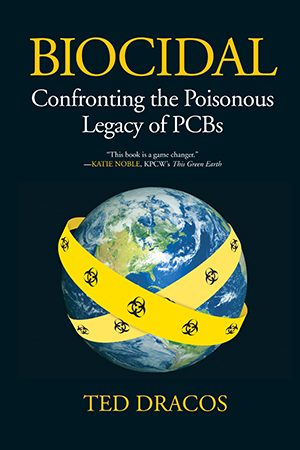 In Biocidal, investigative journalist Ted Dracos tells the full story of PCBs for the first time, drawing on extensive research to document the connection between PCBs and catastrophic human illness, and presenting the latest science as studies draw ever more disturbing links between PCBs and continued health impacts ranging from cancer and autism to immunosuppression and reproductive abnormalities. Nonetheless, Dracos leaves readers with a profound message of hope: the damage is not irreversible. Offering a simple blueprint for steps that can be taken to reduce the impacts of all industrial chemicals, Biocidal ultimately points the way toward a detoxified world.